Jessica Andrade on future after UFC 228: "KO of Karolina leaves no doubt I'm next for Rose Namajunas"
UFC 228 this past Saturday night, was one of the best in the career of Jessica Andrade as she scored a nasty knockout against dangerous strawweight contender Karolina Kowalkeiwicz in less than two minutes of the very first round. In preparation for the bout, Andrade put a heavy focus on Muay Thai to polish up on her striking skills, and judging by the swift finish of Kowalkeiwicz Saturday, it paid off big time. ”I came here believing I would knock her out, but I didn’t imagine I would knock her out so fast, in the first round,” Andrade said at the post-fight press conference. “I was very confident in my strength, confident in everything I could do in there. I knew all the techniques Karolina does, and it worked, I was able to knock her out and get this impressive victory. I’m sure there’s no doubt that I’m next in line for the belt. Days before heading out to Texas for UFC 228, Andrande stated to the Brazilian media she had hopes of receiving a shot at Rose Namajunas’s UFC strawweight championship at UFC 232 on December 29. Now that she has defeated Kolwalkeiwicz, Andrade’s requests for that opportunity have increased. 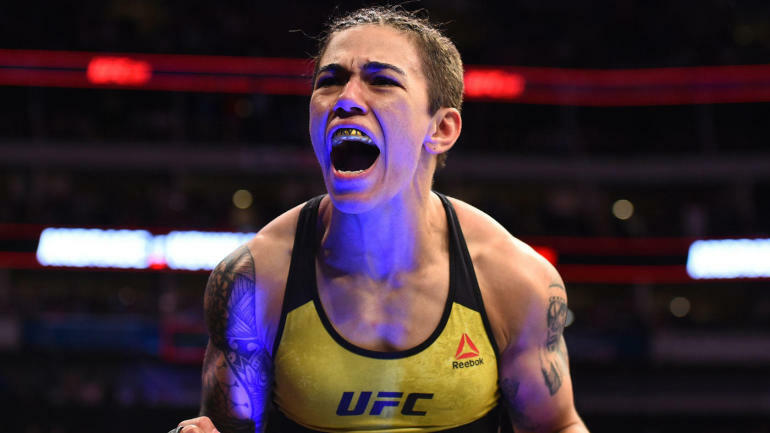 With three straight wins now under her belt, thanks to her jaw dropping UFC 228 KO, Andrade is confident she can handle Namajunas wherever the fight happens.